Hit That Friend Request Button! The Robinson Family is cryogenically suspended before their launch into space in the space-saucer Gemini 12 on man's first mission to colonize a planet orbiting Alpha Centauri. Soon after leaving Earth, a meteor swarm sends the Gemini 12 spiraling out of control, ending in a crash landing on an unknown planet. The Robinsons survive the crash and set up camp, but their preparations to head south to avoid the sudden onset of the cold season are hampered by One-Eye, the giant cyclops, trapping John and Don in a cave. As the Robinson family prepares to leave Earth to colonize Alpha Centauri, a spy from a foreign country, Zachary Smith, becomes trapped aboard while trying to sabotage the space vehicle. After liftoff, the ship is whisked off course and into a meteor storm due to Dr. Smith's extra weight upsetting the navigational computers. 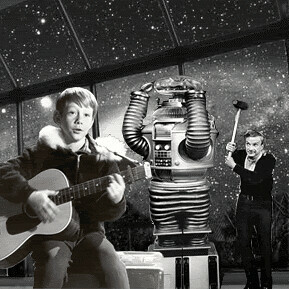 In and attempt to save himself, Smith revives the crew early, resulting in the Robinson family with Smith becoming Lost In Space.